Past miniature painting commission projects by Tajima1 Miniatures. New 1/76 scale or 20mm commission project. More real estate than 15mm figures for some detailed painting but less time consuming than 28mm. 15mm Japanese commission for a Soviet vs Japanese WW2 project. Flames of War Battlefront miniatures. This commission is a current [project for the Autumn of 2013/14. It will be built alongside an opposing Japanese force as part of the same project. This army has many elements and practically all the option of the Flames of War platoons. I think it was based on 12th Panzer. Another distinct German army. All Battlefront figures in 15mm. Numerous options. Done as an addition to a DAK army, this paratrooper army is themed with desert colours. A small Winter themed German force. I was especially pleased with the Half Tracks. Forest themed finnish 15mm troops for the battles in the Karelian forest. This is a work in progress commission for Flame Of War models. It has many interesting new elements not seen in the Polish commission from last year. Most notably the impressive Armoured Train. A large ongoing commission. Lots of conversions including Bersiglieri helmet feathers, Alpini caps and Helmet Feathers and Nappina. Flames of War French. I mostly use "Forged in Battle" minis for French. They have much better Helmet scults than Battlefronts offerings which look like they have New York Fireman's helmets. Latest Commission project. Will include plenty of armour. 15mm aircraft for Flames of War Various makes. A separate gallery of the many objectives I make within FOW commissions. Many are scratch built and one or two are somewhat humorous/light hearted. USA Winter army. Commission for an Ardennes Battle of the Bulge campaign. 15mm Battlefront US Vietnam project for FOW. Note use of red earth basing and weathering. Mix of Copplestone, Kallistra,GW and even 10mm Evil men of the East that I sculpted and molded myself. Mostly long ago departed to Ebay. However,I did spot the Copplestone miniatures on a TMP thread where the poster implied they were his own work. What a Git! Based for fire and fury. Mostly Oldglory15 miniatures supplied by Timecast miniatures UK. Some Peter pig minaitures used to fill gaps and based using East Riding Miniatures MDF bases. This commission is a work in progress and will be complete by November. 2014 AWI commission. Mixed bag beginning with Brunswick Corps. 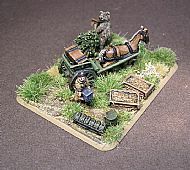 Will also include many examples of re-based and refurbished miniatures from the clients existing collection. French. I think these were mostly "Napoleon At War" miniatures. Saxons, Wurtemburg etc. Mostly AB miniatures.